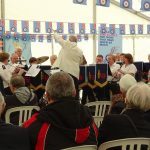 The Band gave two Free Concerts on the Beach Lawns to support the RAFA Weston Branch & Flowerdown House RAFA Token & RAF Locking Re-union Fair. 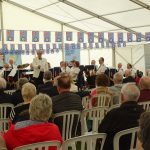 The Morning & Afternoon Concerts were both very well attended. 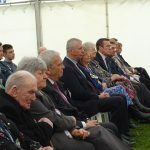 Among the VIP Guests: Deputy Lord Lt of Somerset; Mayor & Mayoress of Weston; former RAF Locking Station Commander; RAF Association Dignitries; former Dam Buster ‘Johnny’ Johnson; RAF Music Charitable Trust. 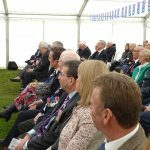 Members of the Audience included many former RAF Locking Personnel & members of the public. 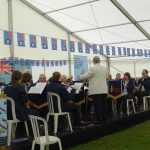 The Weather shone down on the proceedings helping to add to the atmosphere. The VIPs and Band were treated to a Buffet Lunch courtsey of Flowerdown House. 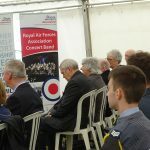 The RAFA Band Stall sold a lot of CD’s making way for the new one being recorded on 21 April. MD Pete loves mobile microphones. Listening & waiting in anticipation. 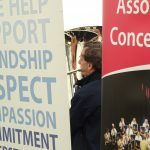 Peter conducting on the edge? 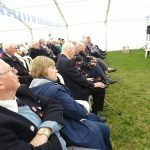 ‘Johnny’ listens for those Merlin engines in the Dambusters. 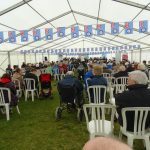 The near capacity audience at the morning concert. 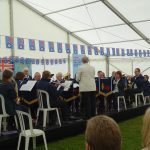 Jackets off at the afternoon concert. Thank Goodness.